Massey Ferguson 7400 model range of tractors, from 137 to 240 hp, with Dyna-VT constantly variable transmission. Find information below on the MF 7400 tractor range. 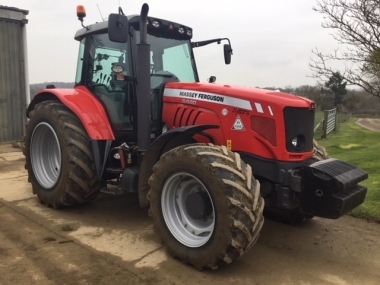 Launched in 2003 the Massey 7400 model range has had a number of specification and hp improvements since its launch, all using the industry leading CVT, the Dyna-VT, the latest varients with the DTM (Dynamic Tractor Management) system. Massey Ferguson 7400 series tractors produced since 2003 have utilised either the 6.0 litre Perkins 6 cylinder intercooled turbo diesel in the MF7465, MF7475 and MF7480 models, or the 6.6 litre Sisu 6 cylinder intercooled turbo diesel in the MF7485, MF7490 and MF7495 models. Initial models were Tier 2 emission compliant, with Tier 3 models launched in 2009 along with the higher hp models MF7497 and MF7499. All MF7400 models have the constantly variable CVT transmission, Dyna-VT, in either 40kph or 50kph versions. Dyna-VT allows an infinitely variable adjustment of forward speed independent of engine revs, from as low as 0.03 km/h (ideal for super creep applications), up to 50kph without any range changes. 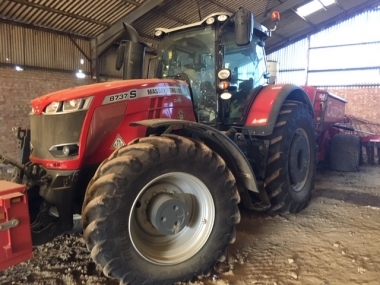 Available with Quadlink front axle suspension, dual stage pneumatic cab suspension and typically supplied with super-comfort package (climate control air conditioning, and super deluxe air suspended seat), the Massey Ferguson 7400 series are high specification tractors and very comfortable for high operator hours. The final models to be added to the Massey Ferguson 7400 series were the MF7497 and MF7499 that were available with the introduction of the Tier 3 common rail engines. 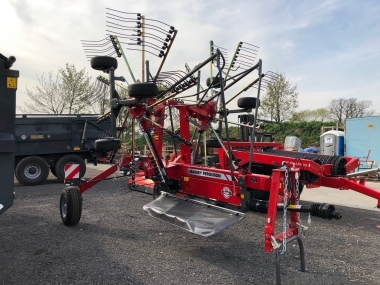 The MF7499 with 230hp provided the light compact tractor ideally suited to the requirements of the modern 2 and 3 row potato harvester, with the Dyna-VT transmission ideally suited to this type of application. The MF7400 series tractors have also proven popular in other tasks where the Dyna-VT constantly variable transmission can be utilised either to improve the quality of the work (such as in potato planting), or to reduce running costs such as hedgecutting and verge maintenanc work where the tractor can be run at moderate engine revs while still being able to change forward speed easily independatly of engine revs, offering significant fuel savings. With simple intuitive controls, that are very similar to those found in the MF6400 series tractors, drivers can easily switch between tractors without the need for input of lots of settings in electronic control screens. For those that did want further operating information, the MF7400 range of tractors was available with the industry leading DATA3 control terminal (full colour from the outset in 2003), which could when combined with electronic spools carry out full automation of the headland management sequence. The Dyna-VT transmission found in all MF7400 series tractors also suited front end loader work particularly well. With left hand power control shuttle, usable without the need for taking the left hand from the steering wheel, the operator still had their right hand free to control the front end loader. This combined with a special 'loader' mode of driving where the foot 'throttle' pedal controlled both engine and transmission ratio, the tractor would behave essentially like a modern telescopic handler. To futher enhance this use, the tractor when supplied with electronic spools had a ready built in joystick in the armrest without the need for a separate joystic for the loader. The latest improvement to the MF7400 series range of tractors came with the introduction of the DTM (Dynamic Tractor Management) system, automating the integration of the controls of the transmision and the engine revs. This was introduded from the middle of 2010 onwards. While operating DTM the driver of the tractor is no longer required to choose the transmission ratio and engine revs independantly, instead a desired forward speed is chosen, and the tractor then selects the most fuel efficient combination of engine revs and transmission ratio to achieve the desired forward speed of work. This excellent feature makes the MF7400 series one of the most efficient tractors availble, and make for a very consistent performance day in day out regardless of operator skill. 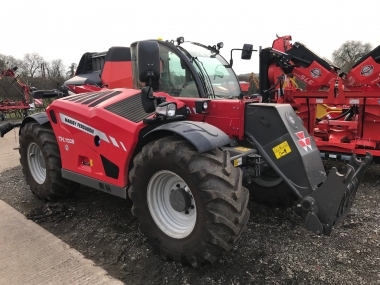 With 7 models in the MF7400 range there is sure to be one that will suit your used Massey Ferguson tractor requirements ! buy every original 7400 - Range part online. We are currently on our 3rd 7480 Massey Ferguson tractor in this range from Chandlers. We have also have had a 7495 and a 7499. 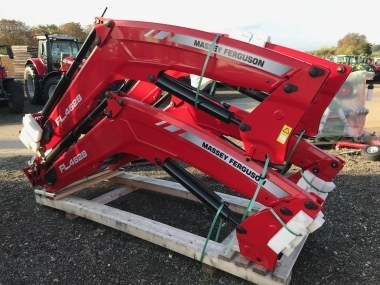 These tractors have been used in our contracting business and are entirely fit for purpose, working hard and long hours the Massey Ferguson 7400 series in our eyes have always been reliable. We run a silaging team pulling two 20 tonne forage wagons with a 7495 and a 7499. The vario gear box works well with the ease of operation on the forage wagon. The Sv 1 and Sv 2 system makes it easier to have a constant and efficient output in the field. The pedal mode makes road work easier and really efficient. As a contractor what really sells the Massey Ferguson to my customers is the fuel consumption. We run a 7480 with front and back mower conditioners with plenty of power to spare. Overall we would and do really recommend the range.